Now that the PlayStation 4 has its feet under the gaming world’s table, attention is beginning to turn towards PlayStation Now. The game streaming service which aims to bring popular titles from the PlayStation 3 and 2 library to PlayStation 4 consoles via the magic of the internet is touted for a release in the United States this Summer, but details are generally scarce beyond that. 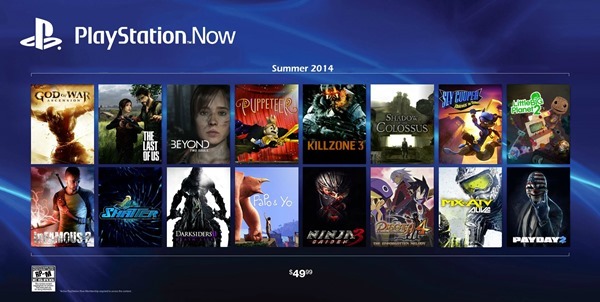 Sony initially unveiled the PlayStation Now service at CES last month, but with the Japanese firm apparently keeping its cards close to its chest we’ve been treated to what it is claimed to be a leaked image that could potentially not only off an insight into what titles will be available at launch but also how much money gamers will need to hand over in order to get in on the action. The image, first appearing on Reddit, appears to show a collection of games alongside the same ‘Summer 2014’ release date that we’ve already been told about. What’s new though, beyond the possibility that those titles shown are going to be launch titles, is the price: $49.99. Beyond that, we have nothing at all. There’s obviously no proof that this is a legit image so we’re going to go ahead and suggest that everyone takes this entire thing with a sizeable pinch of salt. After all, the Reddit user that originally posted it is new to the site which obviously means we’re even more skeptical than usual. That price of $49.99 isn’t exactly clear either – is that per title, or a subscription deal? We have honestly no idea whatsoever. Right now we’re going to say that we wouldn’t want to say whether this image is real or fake, but we know which side if the fence we’d fall on if we absolutely had to pick a side. Looks like we’ll just have to sit tight and wait for Sony to make an official announcement on pricing, availability and launch titles then! Whenever that happens, you’ll get to hear it from us too. Till then, just stare at the image till it gets boring or exciting. But what do you think? Is the image legit? Share your thoughts with us. (Source: Reddit) Thanks, Brandt for sending this in!